Remarkably, MPs received more letters about bees from their constituents in August this year than any other issue – evidence that long-held concerns from scientists about the importance of ecosystem services are gaining ground in the public consciousness. Ecosystem services are no longer the ‘next big thing’ but are of immediate concern and importance to society. Freshwater ecosystem services are highly relevant to many of society’s current challenges, such as flooding, security of water supply, and climate resilience. Understanding the ways that they are (and are not) brought into decision making can provide valuable insights into wider ecosystem services debates. Well-managed wetlands (including our lakes, ponds and rivers) offer a range of benefits to society and can help to mitigate against the effects of extreme weather events. These extreme events are expected to become more frequent due to climate change. Wetlands and floodplains add important capacity within landscapes to store floodwater and also promote infiltration to groundwater, helping to slow the movement of flood pulses downstream and to reduce the severity of flood events. During droughts wetlands can provide flows of water to maintain downstream aquatic habitats and abstraction requirements. Wetlands are important sites of biogeochemical cycling, which can help reduce the effects of nutrients (nitrogen and phosphorus) derived from sewage effluent and surface runoff, helping to prevent eutrophication. They can also provide a wide range of social and cultural benefits that can improve human health and wellbeing, make more attractive urban environments, and provide opportunities for recreation and education. Yet despite their importance, land management decisions frequently degrade freshwater ecosystems and lead to a loss of ecosystem services. Furthermore, climate change and ever greater demands for new development present a significant challenge to maintaining the valuable ecosystem services derived from them. A ‘wicked problem’ exists in that ecosystem services are essential to mitigate against climate change, but their provision is severely undermined by the biophysical processes associated with climate change. Given the high costs of delivering these essential services in other ways (through expensive and unsustainable infrastructure projects such as building large flood defences), why isn’t their conservation and management a greater priority? Since the Millennium Ecosystem Assessment (and the UK’s follow-up National Ecosystem Assessment) made a clarion call to halt the decline in ecosystem services, the ecosystem services approach to environmental management has struggled to make headway in mainstream English policy. Division among different government organisations has led to linked aspects of freshwater policy operating in relative isolation with limited interactions between them. For example, decisions on land-use planning lie with the Department for Communities and Local Government and local authorities, whilst catchment management and flooding issues rest largely with the Environment Agency. Even within conservation policy there are divisions between the protection of important landscapes within National Parks and Areas of Outstanding Natural Beauty, and conserving biodiversity in Sites of Special Scientific Interest. Additional complications in freshwater policy making arise from the fact that policy isn’t something that is just made by governments any more. Other stakeholders – such as private water companies and their long-term planning and investment decisions – are increasingly important. Global and European initiatives (such as the EU Water Framework Directive) also have a significant influence on the UK Government’s policy. Much of the time, this diverse range of international, national, regional and local stakeholders develop and try to implement their own policy frameworks without clear co-ordination or connection. For example, in England, the links between catchment plans produced by the Environment Agency and local plans produced by local authorities are often poor. Since the demise of regional planning in England in 2010, even the links between two neighbouring local authorities’ plans can be problematic. The Government replaced the regional planning structures with a new duty to co-operate. However, this requires a set of processes to be carried out, not that on the ground co-operation takes place on challenging issues, such as where new homes are built. Flood waters, species and flows of polluted runoff have no respect for our hydrologically-arbitrary local authority boundaries. Rivers, which are hydrologically at the heart of catchments, often ironically form the boundary between authorities, underlining the lack of joined-up and spatially coherent thinking in managing the freshwater environment. For most public agencies, ecosystem services are not a key part of their thinking, and as a result most of the policies they try and implement are not aligned with an ecosystem services approach. Where policy measures that support ecosystem services are taken forward, these are often isolated measures rather than integrated into wider plans. Sustainable urban drainage systems (SUDS) are a good example of a policy measure that exploits the benefits of freshwater ecosystems. However, to be more effective and gain wider use in mainstream practice SUDS policies need to work alongside other policies that address issues such as urban pollution incidents, which can damage the ecology and functioning of SUDS. A way forward for freshwater ecosystem services? Equating ecosystem services with financial benefits has attracted significant criticism from some quarters. However, the prospect of improving profitability is undoubtedly motivating some companies to develop innovative partnerships with government agencies and voluntary sector partners to maximize the gain from freshwater ecosystem services. 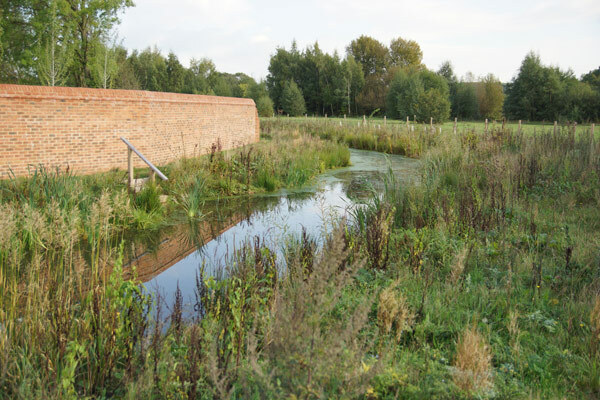 Examples of more holistic ecosystem services approaches are emerging, such as the Sustainable Catchment Management Plan (SCaMP) operated by United Utilities, and the Upstream Thinking project developed by Southwest Water. Both are designed to reduce capital expenditure on water infrastructure, improve water quality, and deliver a number of other landscape-scale benefits. The Upstream Thinking project has restored degraded wetlands in Exmoor and Dartmoor to generate regulating services of benefit to South West Water, through reducing the costs of water treatment. In partnership with landowners and the Devon and Cornwall Wildlife Trusts, the project has exploited the regulating services provided by peat bogs, such as improving water quality, reducing flood risk and maintaining flows during droughts. Additional benefits are provided as well, such as increased carbon storage, improved biodiversity and reduced energy costs for water treatment. The project also plays a role in meeting the EU Water Framework Directive. Both Upstream Thinking and SCaMP demonstrate how investment in an ecosystem approach can be more cost effective than traditional grey infrastructure, yet also enhance the delivery of multiple landscape-scale benefits. Early findings are highly encouraging and are being met with acclaim. The challenge now for government agencies, conservationists and private companies is to scale up these and other isolated examples of success into mainstream policy. How long will it be before society’s dependence on freshwater ecosystem services is recognized in robust, economically-viable and integrated planning policies? Dr Iain Cross is a Lecturer in Physical Geography at St Mary’s University, Twickenham, with research interests in freshwater ecosystem services and their management. His research has focused on the response of lakes and streams to climate change, and is currently working with Dr Congreve to examine how spatial planning policy making can support the management of freshwater ecosystem services (iain.cross@stmarys.ac.uk). Dr Alina Congreve is a Principal Lecturer in Sustainable Planning at the University of Hertfordshire. She has recently completed a project to study cities that are leaders and innovators in climate change mitigation in England and the US. She is currently working with Dr Cross to develop a research programme to study how to integrate ecosystem services into mainstream planning decision making a.congreve@herts.ac.uk). Dr Congreve and Dr Cross would be interested to hear from others working on ecosystem services projects. They are looking to take forward applied research in the coming year and would welcome dialogue with both practitioners and academics interested in collaboration. They are co-chairing a thematic topic session on planning and ecosystem services at the British Ecological Society Annual Meeting in December.